Emily Butterfly’s magical, thoughtful, respectful, empathic, and deeply insightful approach to interacting with and entertaining children, will captivate your child. Emily Butterfly is an interstellar story teller who lives to delight children with her magically unique form of puppetry, storytelling and song. She has had the honor of creating shows and performing for thousands of preschool and elementary school students and feels blessed to have the abilities to create her own puppet friends, write and perform inspirational tales and direct troupes of puppeteers. Ms. Butterfly was blessed to grow up frolicking with wild bunnies, turtles pollywogs, frogs and butterflies. Her first friendships were with faeries and she is delighted to have been raised by a father who was a party supply salesman, which most definitely informed her work as a children’s edutainer. Emily has been writing stories and drawing accompanying characters since she could wield a pencil. Stay tuned for her art page ! Puppets are an amazing medium for children to express themselves,. Ms. Butterfly finds them to be a powerful catalyst in supporting vivid and blooming imaginations, as well as gateways to opening to a deeper self expression. In her years as a performance artist, teacher and event producer, she is grateful to have assisted in creating healthy environments and workshops for children to explore their joy. 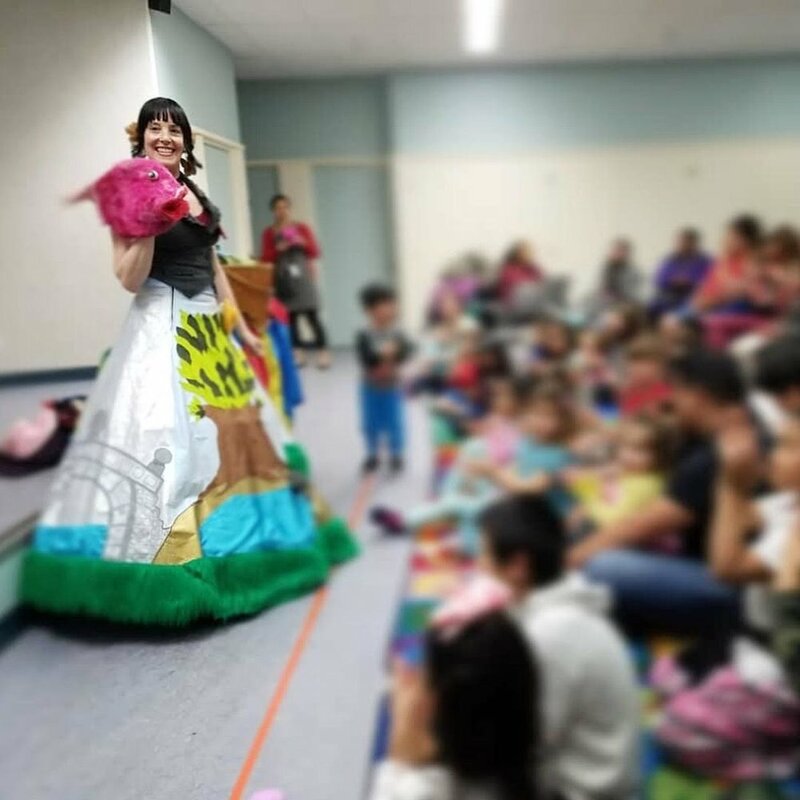 Ms. Butterfly has been blessed with an array of opportunities to work with thousands of children in various environments and is looking forward to continue sharing her knowledge, art, and magic with you! Birthday Party Shows are perfect for children ages 2-6. Each show can be tailored to your child’s interests. Shows are 45 minutes and includes a birthday story and seed planting. An extra fee applies for crafting services. Looking to dazzle your event with a delightfully charming faery? Ms. Butterfly is perfect for welcoming guests to special events and parties, as well as ambient, whimsical strolling throughout the venue. She can truly turn a frown upside down and inspire the merriment of wall flowers. Hire Ms. Butterfly to engage children and adults at events with her wonderful crafting projects. Children of all ages enjoy her offering. Ms. Butterfly brings her delightful 30 minute Story Puppet Circle Time. It's a delightfully interactive blend of puppetry, magic and story telling that is available for one time visits, monthly visits or sessions of 4 visits throughout a month. Story times can be tailored to reflect the themes of any curriculum. Perfect for the 2-5 year old audience. A 45 minute show of delightfully interactive story time with puppets. Ms. Butterfly has a uniquely vast vocal range and a memorable whimsical voice.Check out her work on the Voice Over page. Due to her strong inclusionary nature and respect for the symbiotic exchange between the audience and presenter, Ms. butterfly sits on the same level as the children, much like a circle time. She begins each story time inviting the children to warm up our hands and voices just as puppeteers do! They then wake up her sleepy friend Coo-Coo who tells them what special story they are going to hear. Next they feed the puppets before it is time for to put on her magical glove to share one of many delightful and edutaining stories with the children. After the story they wake up Coo-Coo one more time to say goodbye. Preschool, Kindergarten Day Care and Library visits also have the option to join in a wonderful game called: Story Book Stew. It is a delightfully interactive story making game that is so much fun to cook up with the kids. Emily Butterfly came to Peter Pan and it was magical! We were enchanted the minute we sat down. Emily accommodated our setting, school style and our mixed age group. She let us sit so so close. She was so kind and appropriate helping us be a great audience and she also was able to address the children’s interruptions, curiosity and enthusiasm. Your show was amazing, and a huge hit with the children! I wanted to thank you for entertaining the kids so wonderfully, the kids were amazed and hugely entertained! Your imagination and creativity is out of this world, and we are all grateful for the amazing show you put on! Thank you for making Dora’s birthday such a wonderful, memorable event! The kids will be talking about the show for months to come!